The Environmental Training Center (TETC) presents over two hundred compliance and environmental training courses and seminars throughout the year. In addition, TETC can develop custom programs to meet employer specific requirements. 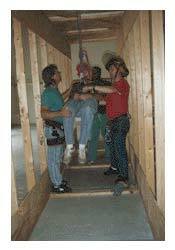 Training can be performed at clients' facility. TETC's courses include: Asbestos, Lead, Permit Required Confined Space, OSHA General Industry & Construction, Hazardous Waste Site, Hazard Communication, Laboratory Safety, Hazardous Materials Transportation, Phase I Environmental Assessments, RCRA, CWA, CERCLA, FIFRA, CAA and Blood Borne Pathogens. See Current (or Next) Quarter for St. Marys course schedules. Register online or contact our St. Marys representative at 912-576-2134 or cell phone at 704-301-3981 for information or to schedule a class at your facility. The Environmental Training Center presents Lead ConsortiumSM training. Indiana, Kentucky, Ohio, and Pennsylvania currently approve these courses as noted. Additionally, Lead ConsortiumSM courses have EPA approval for certification (licensing) under Section 402 of TSCA for Alaska, American Samoa, Arizona, Florida, Guam, Idaho, Montana, Nevada, New York State, New Mexico, S. Carolina, S. Dakota, Virgin Islands and Wyoming. Currently, the following states will accept Lead Consortium training or state licensing along with additional requirements for licensing: Colorado, Connecticut, District of Columbia, Hawaii, Iowa, Kansas, Louisiana, Massachusetts, Maryland, Michigan, Minnesota, Mississippi, Nebraska, New Hampshire, New Jersey, N. Dakota, Oregon, Texas, Utah, and West Virginia. Contact the Center for a summary of requirements. � 1998, 2002 The Environmental Training Center. All rights reserved.